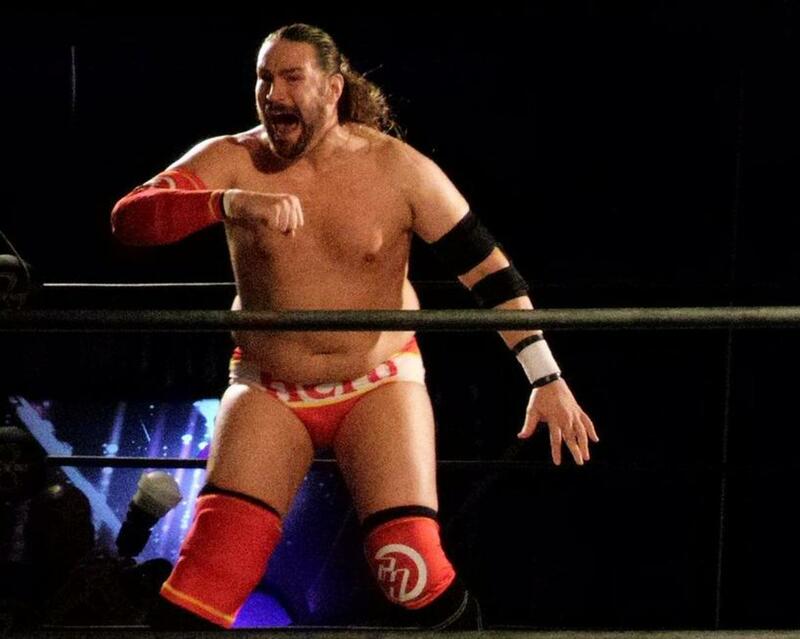 Though he's been consistently incredible for the entirety of 2016, this week might prove to be the defining stretch in Chris Hero's mind-blowing year. Hero capped off a stretch that previously saw him wrestle Tomohiro Ishii and Katsuyori Shibata to rave reviews in England and included a genuine EVOLVE Match of the Year candidate against Tracy Williams last night by wrestling twice at EVOLVE 73 on Sunday. In what was another excellent match, Hero concluded his trilogy with Matt Riddle in victorious fashion. Hero ended the match with a short piledriver, jumping piledriver, and Gotch piledriver combination to come out of the series ahead. They traded strikes all match long with Riddle selling Hero's blows like they were death. At one point, Riddle hit the Bro to Sleep but Hero connected on a rolling elbow to send both men to the mat. But that wasn't the end of the night for Hero. Drew Galloway came out after the match and attempted to declare victory in his war against Catch Point and EVOLVE. That brought out "Hot Sauce" Tracy Williams and Fred Yehi, who wanted a shot at the tag team titles. Williams said that Catch Point wasn't a failure despite what Drew Gulak had said, and he proved that by tapping out Hero last night. Galloway said that he trusted Hero with his life, and the title match seemed to be set with Hero defending on Galloway's behalf after noting that he was no one's solider. But two more teams were added to a four-way elimination match as Gulak wanted to team with his WWE tag team partner Tony Nese and Ethan Page wanted his Gatekeepers to show their dominance. Interference from Darby Allin saw The Gatekeepers get eliminated first. And the champions were the second team out after DUSTIN tapped out to a crossface from Williams. With Catch Point facing off against Gulak, it was Williams and Yehi who won the titles after Yehi submitted Nese with the Koji clutch. Nese showed good sportsmanship after the match by shaking hands with the new champions, but Gulak denied the Catch Point handshake and walked out on the stable. After the show went off the air, William Regal appeared in front of the live crowd and offered Nese a WWE contract. Another WWE contracted talent appeared before the show went on the air as well with Tommy End defeating Williams in a dark match that WWE allowed End to participate in after Galloway wasn't able to wrestle due to injury. The main event was the result of a change to the card after the scheduled EVOLVE Championship match between Timothy Thatcher and Nese had to be canceled due to Thatcher suffering a concussion last night. Gabe Sapolsky tweeted that Thatcher is doing much better today, but said Thatcher would be cautious in recovering after the injury. Gulak was in action earlier in the show in an excellent match against Zack Sabre Jr. The two worked an incredibly unique and almost entirely mat-based bout with Gulak picking up the win after submitting Sabre with a dragon sleeper. Sabre tried to use his arm to get the ropes, but Gulak wrapped that up as well as Sabre tapped out. The match went over 20 minutes as Gulak and Sabre worked their styles masterfully. They previously had a standout match in the Cruiserweight Classic and another in EVOLVE this year, with this around the level of both of those. Earlier in the night, Page got his second win of the weekend by defeating Chris Dickinson in a largely uninspiring match. And Jason Kincaid continued to shine in EVOLVE in a match against seminar-attendee Icarus. During the finishing sequence, Kincaid hit a diving blockbuster to the outside before jumping off of a pole near the turnbuckle and connecting on a double stomp for the win. Jaka pinned Allin for the second straight night in the show's opener. The FloSports era kicked off with two good in-ring outings for EVOLVE. This show had two matches worth going out of your way to see. The third match in the Hero vs. Riddle trilogy lived up to the previous two matches, and Gulak vs. Sabre was excellent as well. It should also be noted that the show was much better off not having Joey Styles on commentary. Aside from his garbage remarks, Styles was genuinely awful last night and really hurt the show. Lenny Leonard was again fantastic solo and continues to be a bright spot on EVOLVE shows. Drew Gulak defeated Zack Sabre Jr.